Start-up companies that want to do business internationally often find themselves in a Catch-22. They know they must build contacts in overseas markets, but they don’t have time or money to travel the world. Yet strong international contacts could be the fuel that pushes some start-ups over the edge to long-term success. For example, Vifant LLC has identified a potential market for their product in Europe and developing countries that far exceeds the market in the U.S. Having the ability to initially launch this product internationally would enable Vifant to be more successful than if they launched only in the U.S. The Welcoming Center for New Pennsylvanians and the University City Science Center have teamed up to help companies like Vifant to launch more quickly into the international market. They are using a $500,000 “i6 Challenge” grant from the Economic Development Administration’s Regional Innovation Strategies program to establish the Global Startup Accelerator (GSA) in Philadelphia. The six-month program provides mentors for the start-up companies, teaches them how to effectively pitch their companies to non-U.S. investors and collaborators, and introduces them to the international community in Philadelphia. There are 16 early-stage life science, medical device, and health companies enrolled in GSA’s first cohort. These companies will focus on opportunities in the European market and will present to potential investors at the BIO International Convention in Philadelphia in June. Cohort 2 will be comprised of up to 25 technology companies in such areas as Medtech, Edtech, Fintech, smart cities and mobile health. These companies will focus on entry into the Indian marketplace and will present to investors with an international focus. The first cohort of companies began the program in January, and selection for the second cohort will start in September 2019. By 2022, the anticipated impact of the GSA is expected to include 240 direct new jobs, $6 million in new foreign investments, and $12 million in new follow on investments. 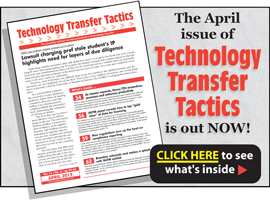 A detailed article on the Global Startup Accelerator appears in the March issue of Technology Transfer Tactics. To subscribe and access the full article, as well as the publication’s subscriber-only archive filled with 12 years of best practices and success strategies for TTOs, CLICK HERE.